Need a gift for the guy in your life- we’ve got you covered with a VTech Connect to Cell giveaway!! Congrats to our winner D’vora!! Ask any adult woman about the impact her relationship with her dad had in shaping the woman she’d become and you’ll likely get an earful. The role a father plays in the evolution of his daughter is irrefutable, sacred and impacts her self-esteem, confidence and ultimately how she interacts with the men in her life and the spouse she will choose. I’m determined to ensure that my husband is cognizant of the fact that his every word and action are being measured by our daughter, who’s like a sponge soaking up every last one of his compliments and criticisms, too. Unfortunately, it’s no easy task convincing my husband of the larger-than-life role he plays in my daughter’s universe and the lasting effects his words may have on her. I’ll admit my careful monitoring of their relationship has certainly led to some heated arguments between us. Being that my husband â€” like so many men I know â€” isn’t much of a verbal communicator and seems more apt to bond with my daughter over a shared, physical action, I’ve found that sometimes a new gadget is a fabulous way to help dads and daughters bond. For my husband and my daughter the VTechâ€™s new Connect-to-Cellâ„¢ phone was RIGHT UP their alley! As in my daughter ever the clever, tech savvy girl, so thoroughly enjoys teaching her pops how to operate gadgets that will ultimately make his life easier. 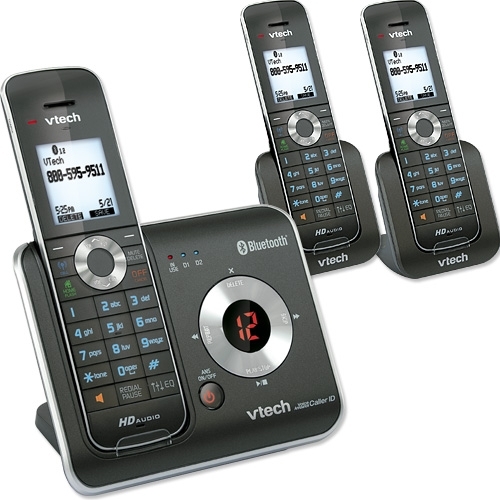 And for dads (like him) who talk primarily on mobile phones but experience problems with spotty reception or dropped calls at home, VTechâ€™s new Connect-to-Cellâ„¢ phone system (DS6421-3, MSRP: $99.95) is the solution. This system can make and receive cellular calls while the cellphone is charging in a different room of the house, but with the more reliable range of a landline system. The three-handset DS6421-3 also features HD audio with an equalizer for crystal-clear clarity. Users can improve the cellular signal in the home by strategically placing the DS6421-3 base where reception is the strongest, and then putting the extra DS6421 handsets throughout the home to avoid the mad dash to answer calls while the cell phone is charging. The DS6421-3 system can register up to four cell phones, and two cellular phones can be connected to the system at one time. Working as a virtual two-line system, users can talk on a cellular call on one handset, while another handset is used simultaneously for a landline call. For added convenience, the DS6421-3 can download up to 6,000 cell phonebook directories into the system. And guess what The Staten Island Family readers- I’m giving one of these babies away- JUST in time for the Holidays! For a chance to win leave a comment on this blog post telling me why your man needs this phone. For a second entry you can like The Staten Island Family on Facebook and for a third entry you can followMadijack on Twitter and retweet this giveaway. Good luck! Giveaway ends December 29th at 12 midnight EST. Originally published on 2011-12-21 by Melissa Chapman at The Staten Island Family .